Wow, these muffins are hands down the easiest I’ve ever made! With only 5 basic ingredients, you can quickly whip up a batch of these. Freeze the rest for up to two months and you will always have a snack on hand. All you have to do is microwave them for 30 seconds, and voila! Be careful, though, because the pecans get quite hot! Let them sit for another 30 seconds before eating them, or you might just burn your tongue as I did my first time. 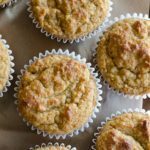 The rich crispiness of these muffins is addicting. Watch out, they’re dangerous as they are so small and delicious that you’ll want to keep popping them in your mouth one after another! My advice is to not consume the entire muffin at once, but to bite it in half and enjoy the crisp edges with the soft, chewy goodness inside. This is another fantastic recipe from Make-Ahead Meals for Busy Moms. I’m having so much fun with this book, that I would love to give one of my readers a chance to win it! All you need to do is leave a comment to this post, that’s it! Well, of course, you need to make sure you fill in the email address field in the comment box so I can contact you if you win! And, no, I do not share email addresses with any marketers or make any money off them. Wouldn’t that be wonderful? 🙂 Heck, I don’t even use them myself except to contact my winners! No email, no way for me to contact you. If you do not win, you can still join in the fun by purchasing Jane Doiron’s book on Amazon. She also has a blog where she shares more make-ahead recipes. Even if you’re not a woman in the labor force, or you do not have children, you can still benefit from prepping or making your meals and snacks ahead of time. You may choose to eat more nutritional, have more relaxed weeknights, and may even have time to pick up a new hobby! To participate in the contest, say “hello” to me by Sunday, March 28 at 9:00 PM CDT. And, sorry to my international readers, but in order to qualify you must live in the domestic United States. I’ll randomly select and announce the winner Monday morning! Good luck! Lightly grease mini muffin cups and set aside. Mix all of the ingredients together in a bowl. Spoon evenly into the muffin cups and bake for 18 to 20 minutes. The edges will be crispy. Remove the muffins and cool completely on a wire rack. 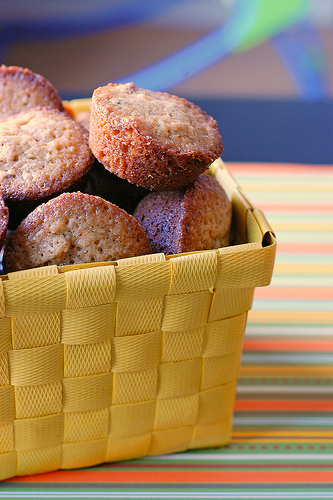 To Freeze: Place the cooled muffins in a labeled freezer bag and freeze up to 2 months. Warm muffins for 30 seconds in the microwave, and let set for 30 seconds before eating. Ooohhh, count me in for the cookbook giveaway! Oh my! These look scrumptious! I love the fact they freeze well. Thanks, Nikki! I’ve been eyeing this cookbook! Hellllo!! Thanks for all the tips and recipes you post! i love your site! 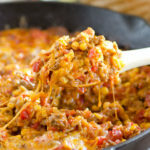 I just found the make ahead meals blog today. What a great idea! I would really love to have this. Thanks for the chance! Love the blog!!!! Keep it up!!!! Hello! I’d love a copy of this one!! Those look wonderful! I would love to win that cookbook!! Hello! 🙂 I love that these muffins have so few ingredients! Look easy and delicious!! Hello! I love your recipes – I often print them off and enjoy them! hello! great website..i always enjoy the yummy recipes and pics! I would love, love, love this cookbook. I think being a homeschooling mom with seven kids qualifies me as being busy. 😉 I need help! Hello! Happy Thursday! Thanks for the chance! Those look delicious! Thought I am not a mom I know my siblings that are parents would love this book —it would come in so handy. Hello!! These muffins look delicious! I have been trying to figure out how to make meals ahead. It would save me such headaches (and money)! I will also be making these muffins this weekend. Thanks so much. Yummo! I have been looking for more make-ahead recipes…ones where you can make them on a Saturday and put them in the freezer to pull out on a busy weekday for dinner! I would LOVE to win this cookbook. I have a 15 month old at home and we’re picking up a puppy tomorrow so it will be like having 2 babies at home. Between that and working full time I need all the meal prep help I can get to keep healthy food on our table as opposed to crappy yet convenient stuff. Love your blog. great job! HELLO. I just found your site and I love it. Would love to win. Have heard this cookbook is great. I’m a SUPER-busy single mom of 2 who are in Softball, Gymnastics, and Piano – I have been fascinated with her receipes too! I would love to win the cookbook. That cookbook sounds wonderful. The muffins look great. I would love the cook book! You had me at mini – I will be making these over the weekend, can’t wait to try them out! I have faith in all your recipe postings, so far I’ve tried the pizza bites and sesame dressing which are now repeaters. I would love to win this book, sounds awesome! Lovely giveaway. Would love to win! hello 🙂 love the site! These look so tasty. I would love to win, because it looks like such a great cookbook. Hi! 🙂 love the recipe and the giveaway! Mmmmm, this looks super yummy and easy! Looks like a great cookbook too! This is the best blog I’ve found. Love the recipes and ease of making the items. Would love to win the cookbook!!! Hello! Great Giveaway! I work from home, but work long and hard hours, so nice to be able to make ahead meals. I work 55 hours next week and have one day to cook all the dinners I will need for my family of four. Cute book. I hope I win, I’d to give it to my friend, who’s due in August! Jane really has some great recipes in this book and I would love to have it. With 2 teenage boys I am always on the go and this would be very helpful. Great recipe & looks like a great cookbook! Count me in! First time to visit your website, and I love it; really nice. I would love your cookbook! Sounds like a great book..thanks! Hello. New to your site but looking forward to perusing your recipes. Hello. The recipe looks yummy! I hope I win. I LOVE trying out new recipes! “hello.” 🙂 I tried these muffins a few months ago- they ARE easy and they rock! I’m definitely going to check out your Mini Apple Pies recipe too! Thanks for the chance to win the book! those muffins look delicious! thanks for sharing! “Hello!” I want this fantastic cookbook, count me in the contest!! I just found your blog recently, searching for a boxty recipe for St. Patrick’s Day! This cookbook looks like a winner, too! Hello! I found your blog on a link from Jane’s website! Thanks for the giveaway! What a lovely giveaway! I’m about to start back to work, and this sounds like it would really be helpful in getting dinner on the table in a timely fashion. Thank you! Hi! The cookbook sounds awesome! I am not a mother, but I’m a working girl with a sizeable commute – so trying to get in working out and eating dinner every night is very hard….I keep meaning to get around to meal planning and cooking meals ahead, but so far I haven’t been that successful! Hi!! I check out your blog every couple of days… you are on my favorites list. they look yummy! I love pecans. I think this cookbook would really help me out! If I don’t win, I’ll probably buy it! As a mom of two 2-year olds and a 6-month old, this cookbook will definitely come in handy! 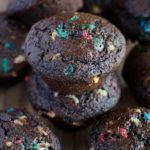 These mini-muffins are something the twins would love! hello! glad to have found a new frugal site!! cant wait to make these. and the cookbook would be a bonus! I’m having a baby in five weeks and need to stock the freezer. This cookbook would make it a lot easier!!! I’m making these this weekend!! They look delicious! Just found your blog…great recipes! The book looks wonderful too. Would love to have this book. Please enter me. I’ve read so much about the cookbook, looks great; so do the muffins! Hello! I hope you have a blessed week! These look delicious! I can see how they would be addicting! Hello! I like your blog! I also would really benefit from a cookbook like this! Thanks. Howdy!! I’d love to win!! Thank you!!! Hey ho, hey ho, it’s off to work I go. Hello! I would love to win this! With a 2 and 4 year old I could use it for sure! Would love to add this cookbook to my arsenal. It looks like a good one!! Oh man, I love pecan pie and this looks so simple and a great way to get my fix! Thanks! Fun blog. Thanks for the good tips! Why didn’t you think you would like the cookbook at first? I think it looks fabulous!! I need to this to feed my cookbook addiction. I would like the cookbook. I love the Fixing meals ahead phenomenon. Hi!! I look at your blog everyday for your great recipes! I think I am going to make these for a friend of mine that gave up sugar for lent. She has about a week and a half to go. Hello!! I would love this cookbook!! Hey there! I would love to add this cookbook to my kitchen! 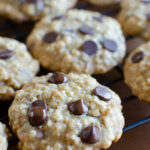 Mmmm, I’ve seen these around and everyone has said the same thing….make them because the are so gooood and yet so easy. This recipe sounds great! 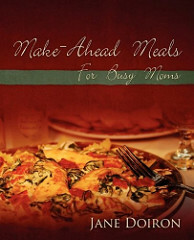 I may not be a busy mom, but I am a busy grad student and would definitely appreciate this cookbook! can’t wait to try these..and win this cookbook! Hi, I just found you.I love muffins . Can’t wait to make these .would love to win the cookbook. wow! 111 comments and counting! Well hello and congrats on the great following you have! I’d love to win a copy of the cookbook being a busy mom! Thanks! Hello! I found your link in an email from Make Ahead Meals. This looks like the best cookbook…and the muffins look easy and delicious! Thanks for the giveaway! Muffins look great! Cookbook should be awesome….Hellow! I am so excited to make these muffins, pecan pie is my fav!!! One of my favorite bloggers – she is very entertaining and the recipes are wonderful. Thanks for having such a great giveaway! I rely way too much on junk food instead of making healthy meals, so this book would be really helpful. this book sounds like just what i need. fingers crossed!